Yes, you are! Did you know that? Well, I hope so - all of you who read my blog are fantastic in my book - I so appreciate you visiting me here in my little corner of the world! I'm getting close to 300,000 visits, isn't that cool?! Be looking for some fun Blog Candy when I get to that number! I just have to say how wonderful it was to meet so many of you blog friends at Convention. All of you who approached me and told me how much you enjoy visiting here just blessed my heart. It was a humbling experience and honestly, I'm thrilled to know that someone actually reads my stuff! So THANK YOU for being a blessing to me! Now, since you know you're fantastic - want to see your card?!! Ok! I started this one with an Elegant Eggplant cardstock for the card base and I layered it with Wild Wasabi. The main panel is what's cool! I was playing around with my New Fancy Fan Letterpress plate last month - actually the day my New Catalog pre-order arrived and created this Whisper White background on Poppy Parade. (I'll show you that card later - it's basically the same, but different colors) During my June Team Meeting, I demonstrated this embossing technique on the Elegant Eggplant cardstock and I couldn't very well let it go to waste could I? To make the background, I used my brayer to roll Whisper White Craft Ink onto the Letterpress Plate. I placed my cardstock on it, then rolled it through my Big Shot. As soon as it came out, I covered it with White Embossing Powder and heat embossed it with my Heat Tool. I took out the stem image from the Fabulous Florets stamp set and stamped it in Versamark ink over top of the already embossed design. I added New Wild Wasabi Embossing Powder to the inked area and heat embossed it again - embossing on embossing - how cool is that?!!! Next, I inked the flower image with Versamark and stamped it on Whisper White cardstock, then heat embossed it with Clear Embossing Powder. I used one of my Sponge Daubers to burnish the flower with Daffodil Delight Classic Ink. That's the classic Emboss Resist technique and it's so easy to get gorgeous results! 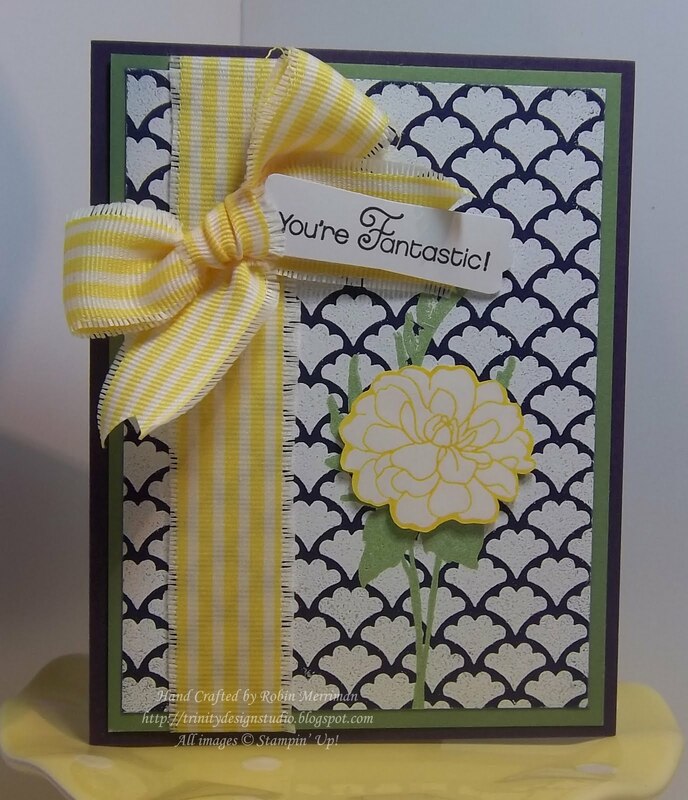 I trimmed out the flower with my Paper Snips and popped it up over the embossed stem with two Stampin' Dimensionals. 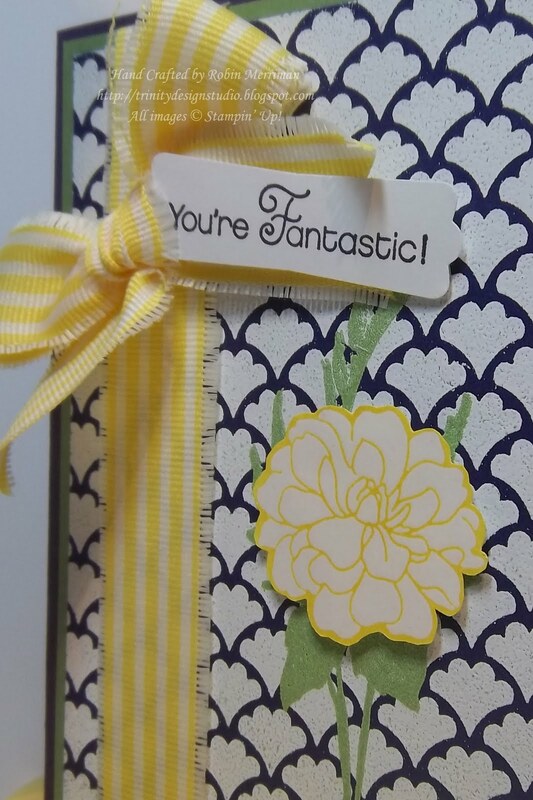 The ribbon is actually the Daffodil Delight 1 1/4" Striped Ribbon. I used my Paper and Craft Scissors to trim off the bound edges on both sides and pulled away some of the threads to make it a little 'shabby'. Part of the ribbon was wrapped around the card layers and secured on the back of the Wild Wasabi. I tied the rest in a sweet bow and attached it with Mini Glue Dots. The greeting is from the new Hostess stamp set Perfect Words. (Did you know that as my Hostess, you can get this fun set for just $9 Hostess Dollars clear mount? That would be FREE Money! Yep! Call me!) I stamped it in Elegant Eggplant on Whisper White and punched it out with my Modern Label Punch. It's attached with a Mini Glue Dot to the center of the bow and that card was d-o-n-e, done! So, now you know that this card started at my June team meeting - I'd love for you to be able to join us next time! I am blessed to have a wonderful group of demonstrators on my team and we are never short in the FUN department! Don't live near me? That's no problem either, I support demonstrators in several states and you'd be no exception! In case you haven't heard, there is an AMAZING $99 Demonstrator Starter Kit Special going on this month! What are you waiting for? I know, you probably never thought you would want to do something like this - but can I tell you from experience - Stampin' Up! is NOT like every other company on the block! I was with another company for 13 years - yep, 13! And the best decision I EVER made was to leave that company and join SU! I'm happy to share my story with you - it's been so amazing to see God's hand at work and I know that I'm just where I need to be. I'd truly love it if you'd join me on the journey! So, let's talk - send me an e-mail at stampwithrobin@yahoo.com OR you can visit my Stampin' Up! website and see the $99 offer for yourself. Heck, you can even join right from my website if you just can't wait to get started. Click the JOIN THE FUN button at the top right of my home page. You know there's a little extra somethin' for all of you who join my team this month - a fantastic Christmas Keepsake Box Project Kit that includes a NEW stamp set from the upcoming Holiday Mini Catalog! Oh yeah! All the details are at the Join Robin's Team link above, so check it out! Lastly, if you need the supply list for today's project, I've included it below. That way you can easily shop from my Online Store for all the fun Stampin' Supplies you need! Or you could even be getting them at a discount by becoming a demonstrator! Just sayin'! It's Roxanne (Cindy Fodors downline) we met at convention. Loved it!!!! you said the next time I stopped by to say hi, love your site. Have a bless day. I love the double embossing. What a WOW card. Thanks for sharing. what a fabulous card ~ I don't have any letterpress plates...hmmm...I'm rethinking that! TFS and have a super day Robin!